Dr. C.R. Patel with Saige. When Saige Elizabeth Carpenter was born at 6 p.m. on Jan. 6 at Wooster Community Hospital, her parents and grandparents were elated to add another healthy girl to their growing family. “We all went home that night thinking we had a completely healthy baby,” said Saige’s paternal grandmother Victoria Carpenter. But, by the next morning, things had rapidly changed. The family was informed that Dr. Kathryn Helmuth, an Akron Children’s Hospital Pediatrics (ACHP) physician, who was rounding in the nursery, heard a murmur that caused her some concern. In addition, Saige’s coloring was off and her oxygen saturation levels were in the 70s. It was quickly determined that Saige, who was less than 24 hours old, needed to be transported to Akron Children’s for evaluation. The ambulance was met by cardiologist Dr. C.R. Patel who immediately performed an echocardiogram followed by a heart catheterization. 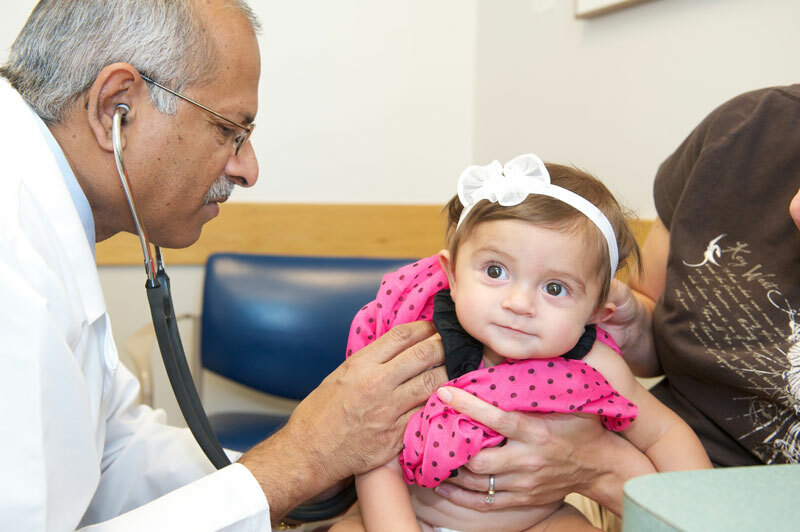 Dr. Patel diagnosed Saige with a condition called pulmonary atresia. Dr. Chandrakant Patel examines Saige. Although the Carpenters have never met Dr. Helmuth, they feel deeply indebted to her. Since her birth, Saige has undergone 2 open heart surgeries and 4 catheterizations. After spending her first 7 weeks in the PICU followed by a second hospital stay in early July, her parents Jobeth, Michael and big sister Adeline Rose, age 4, are savoring having her at home in Orrville. Saige receives services from Help Me Grow and will have another surgery between the ages of 4-5.